It was interesting hearing Jancis Robinson, in New Zealand for Pinot Noir 2017, talk to John Campbell on Radio NZ after the event. She described Waipara pinot noirs as ‘grunty’ and the most Burgundian of all the New Zealand wine regions. Amongst all the connotations that ‘Burgundy’ conjures up, one means ‘age worthy’ to me. And so I chose an age-worthy Waipara pinot noir to feature in my February 2017 Urban and Country column on cellaring wine. 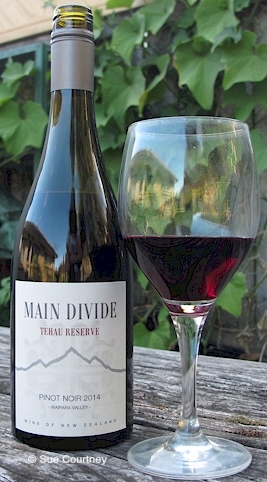 Main Divide Tehau Reserve Pinot Noir 2014 is a saturated deep ruby hue in the glass. The bouquet excites me from the outset – there’s manuka woodsmoke / smoky bacon, aromatic spices, musk and black cherries and then in the palate a gorgeous combo of spice and savouriness with the smoky oak beautifully honed, a sensuous earthy depth, layers of spiced berries and the texture silky smooth and flowing. I would say drink now or cellar confidently to 2022, perhaps longer. The wine is made from select parcels of Waipara pinot noir grapes and following the Pegasus Bay / Main Divide philosophy it underwent natural fermentation with minimal human intervention. Alcohol is 13% and price is around $33 a bottle. In January I reviewed Main Divide Reserve Pinot Noir 2012 from the Waipara Valley. Check out the review here. This is a wine that is developing beautifully. Main Divide is the second label of the revered winery Pegasus Bay. The wines are structured and complex yet drinkable at the same time. Podcast of Jancis Robinson talking to John Campbell on Radio NZ here. This entry was posted in #nzwine, pinot noir, waipara and tagged 2014, main divide by Sue Courtney. Bookmark the permalink.